I used to have a kitchen tile that said, “Eat, Drink, and Be Merry, for Tomorrow We Diet.” Unfortunately, I had a tendency to take these words to heart. The exception was that “tomorrow” usually involved another day of eating, drinking and being merry. “Die(t) Trying” really resonated with me, because the women in the story exhibit the same unhealthy behaviors that I tend to exhibit. It is obvious that the author Kenneth Schwarz, Ph.D., has a lot of experience and knowledge in this area, because he nailed eating issues to a “T” or in the case of this book, a (t). 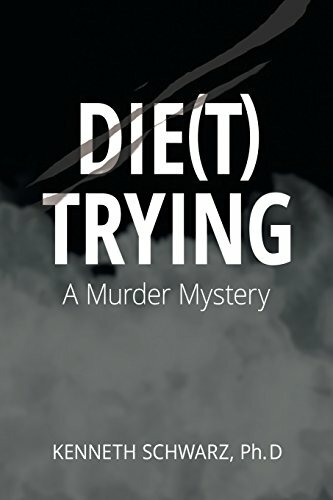 Dr. Schwarz writes “Die(t) Trying” in a fictional format that presents characters with eating issues. The protagonist Maria, was once overweight. She has become an expert on dieting and weight loss through her personal experience. When her psychologist friend Don approaches her with some business ideas about helping women deal with weight issues, she is intrigued. When she begins working with her friend Chloe, she gains a great deal of insight into the process of locating the core of why women commit “murder” on their own bodies. The destruction actually extends beyond “killing” their bodies, because they also use overeating to kill other aspects of themselves including feelings, thoughts, and hope. Maria takes on the role as a detective to delve into Chloe’s psyche, so that she can find the root cause of Chloe’s need to overeat. Chloe has a tendency to put up a lot of resistance because she developed her unhealthy behaviors as a coping tool, so Maria’s work is really cut out for her! "Die(t) Trying" by Kenneth Schwarz, Ph.D. was very insightful. I think most women who are dealing with weight issues will find a lot of the information presented to be extremely valuable. As I read, I was surprised at how much of the material related to me. While readers will have different reasons for finding the information useful, I think most of us will see that there is a lot of common ground among us. I highly recommend that women who are battling obesity read this book. It would also be helpful for their friends and family to do so as well. I will definitely check out other books by this author.